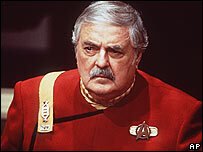 The ashes of Star Trek actor James Doohan, who died on Wednesday, are to be sent into space at his request. Doohan, who was 85, played engineer Scotty in the original sci-fi series. He died of pneumonia and Alzheimer's disease at his home in Washington. His agent said Doohan and his wife Wende had discussed sending his ashes into space, following those of Star Trek creator Gene Roddenberry. Star Trek co-star William Shatner has sent his condolences to the family. "A long and storied career is over," Shatner said. "I knew Jim when he started out in Canada and I knew him in his last years in America, so we go way back. My condolences go out to his family." The Space Services Inc company said Doohan's ashes could be on a Falcon 1 rocket launching from California's Vandenberg Air Force Base, tentatively scheduled for launch in September. The ashes of Star Trek writer John Meredyth Lucas, who died in 2002, are also set to be on the flight. Doohan's Star Trek character Scotty manned the Starship Enterprise with Captain James T Kirk, played by Shatner, and Mr Spock, played by Leonard Nimoy. The original crew lasted for three series, starting in 1966, before the show was axed, but the team reunited for seven big screen movies. Although Doohan became synonymous with the line "Beam me up, Scotty", it was never actually said in the series. Canadian-born Doohan had been a successful character actor on radio and TV before landing the role in the pilot Star Trek episode. But he quickly became typecast as the Scottish space engineer, finding it difficult to get other roles. But he learned to embrace his place in sci-fi history. "He loved being Scotty," said his agent Steve Stevens. "He loved the whole Star Trek thing. I don't think people knew what a terrific actor he was." Mr Stevens added: "James loved the idea of being in an airport and people from some obscure country, barely able to speak English, would come over to him and say, 'You're Scotty'.'" "I've never known someone so gracious with fans." Doohan became a father again at the age of 80, when his wife Wende, 48, gave birth to daughter Sarah. 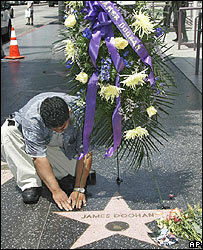 His last public appearance was in October 2004 when he received a star on the Hollywood Walk of Fame.